The Alexander Valley Film Festival runs Oct. 22–25, at various locations in Healdsburg, Geyserville and Cloverdale. For a full schedule and tickets, visit avfilmsociety.org. 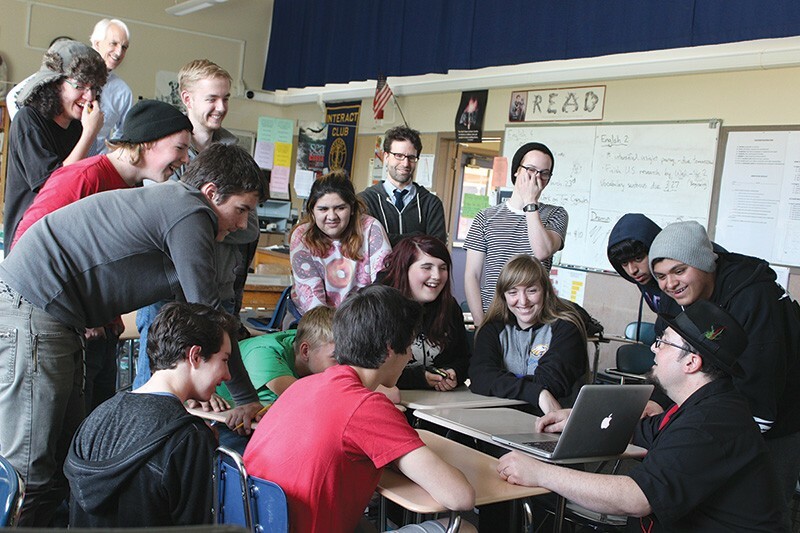 FOR THE KIDS Pixar animator and Alexander Valley Film Society board member Adam Burke (bottom right) leads an animation workshop with students at Cloverdale High School last March. Two years ago, Ryan and Kathryn Hecht were living in New York City and looking to get out. The couple, who previously worked as actors, googled "movie theaters for sale," and soon found themselves in the North Bay running the Clover Theater in Cloverdale. With a background in nonprofit administration and development, Kathryn Hecht began working with various local organizations while Ryan managed the theater after opening with a wildly successful Kickstarter campaign. Buoyed by the swell of support from locals in Cloverdale, Geyserville and Healdsburg, Kathryn launched the nonprofit Alexander Valley Film Society last September to further develop and enrich the creative community by offering educational programs and a film festival. This month, the inaugural Alexander Valley Film Festival debuts in northern Sonoma County, bringing a culturally rich array of international films, acclaimed documentaries and even some old favorites to several big screens Oct. 22–25. "We've had a tremendous out-of-the-gate experience," says Kathryn Hecht. "It's been a truly organic, community-derived project. It's so clear that it was meant to happen. It was the right time, the right place and the right energy for a film festival." In the past year, the film society collaborated with Alexander Valley public schools on various projects, ranging from interactive workshops with industry professionals like Pixar animator Adam Burke to helping 15 high school students work as interns on a feature recently shot in Geyserville. "I wanted the festival to reflect the ethos of the film society," Hecht says. "And the ethos of the film society was a direct cultivation from what the community was telling us." The people Hecht works with responded eagerly to the film society's passion for diversity and risk-taking. With that in mind, the Alexander Valley Film Festival curated a lineup of films around the theme "Daring and Courage." The first film the festival booked was Güeros, the debut from Mexico City filmmaker Alonso Ruizpalacios. "I saw that film and fell in love with it," says Hecht. Güeros is a tale of self-discovery centered around three young men tracking down a local folk hero. It's beautifully shot in black-and-white and reflects the kind of filmmaking that inspires her. Other highlights include Trash, starring Martin Sheen and Rooney Mara, and directed by Stephen Daldry (The Hours), and the acclaimed Alaskan adventure film WildLike, which screens with director Frank Hall Green in attendance. On the documentary side, On Her Own, about Sonoma County farmer Nancy Prebilich, plays at a screening that comes complete with barbecue and live music. The new doc from Winter's Bone director Debra Granik, Stray Dog, gets a screening, and Most Likely to Succeed director Greg Whiteley skypes in for a Q&A. The festival is also a time to have a little fun. A slate of special features includes a late-night showing of Ghostbusters, as well as the counterculture classic Easy Rider paired with a newly rediscovered Dennis Hooper documentary, The American Dreamer. The festival also presents a special 20-year anniversary screening of Toy Story to close out the weekend.